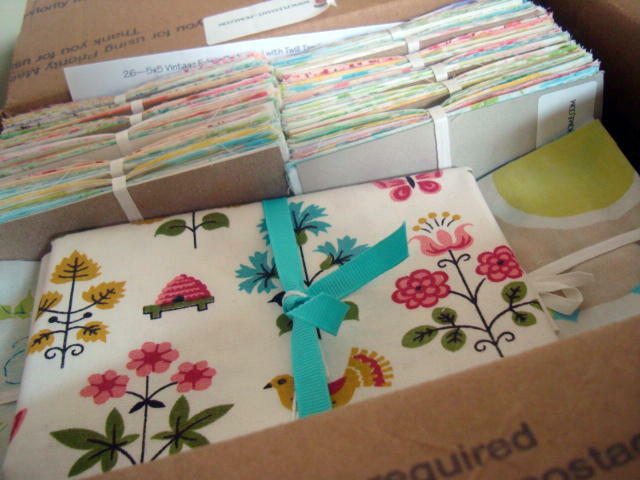 Here is my cutting table piled high with table runners all prepped and ready for me to machine quilt. 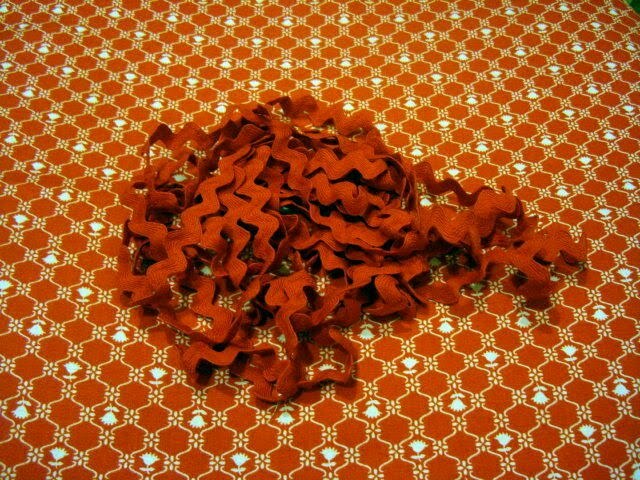 I think I'll be working with pebble quilting - maybe. So you can see I have my work cut out for me. It is a busy week. Cleaning, cooking, eating, playing bingo with family and having a good time with some work thrown in. And then Friday and Saturday are busy with a big (uninteresting) project. So like you, my week is full. So I'm taking a tiny blog nap and I'll be back in a week or something. Not long, but long enough to get my tree up and get moving on Christmas prep. In the mean time - Happy Thanksgiving. I'm thankful for so many things. Among them I am grateful for so many friends all over the world. 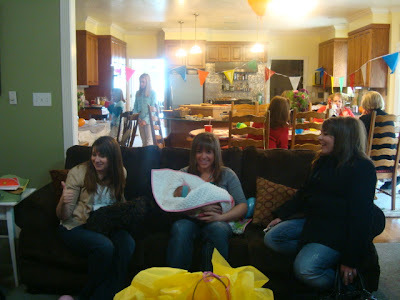 Saturday was a baby shower for Whitney and Allison at our house. 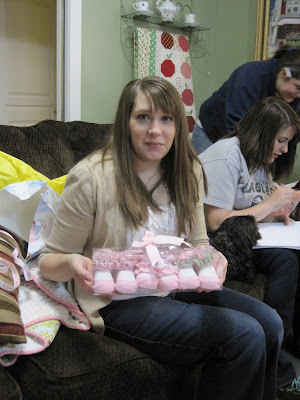 We decided to wait until after Alli was born to shower her with fun and wonderful gifts. This way family and friends were able to pass her around during the shower, too. I made this little banner for the nursery. 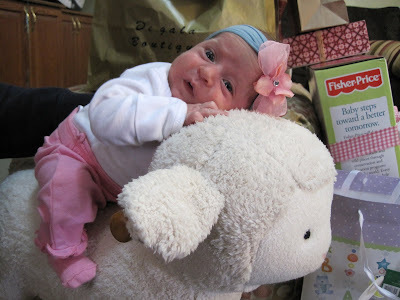 This little sheep is covered in Minkee and is from Justin and Natalie. I love this picture. 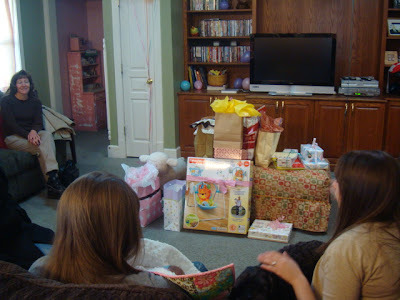 Here is Whitney opening the fabulous gifts for baby Allison. I can't believe the cute stuff! They never had baby clothes like this when my girls were born. Quite the haul, really. This little girl is so spoiled. 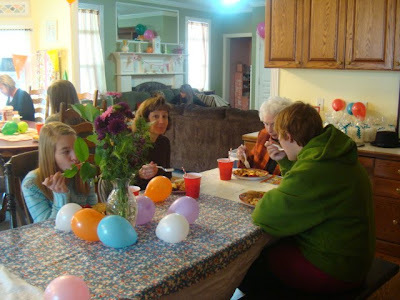 We had a circus/carnival theme for the party and we decorated the house a bit. The shower was in the morning and I made brunch. Brunch is always fun I think. This is what you get at a party at our house. The kids are always playing tricks. So Laurie was made to be the bearded lady. 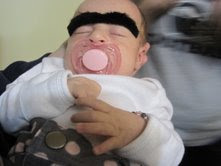 And Allison got to be unibrow baby. The kids thought it was hilarious. It is a bit funny. I have to admit. Thanks everyone for coming and for your thoughtful gifts. Everything was just lovely. Whew! what a busy weekend. As the seasons are upon us for Thanksgiving and then quickly Christmas, our schedules get packed tighter and tighter. I know you are with me on this. Of course it is good and keeps us pacing ourselves to stay up to date with friends both online and off. It is so nice to go to my computer and come away with brilliant ideas from so many of you to help get me through the holidays and other events. Reminds me of the Beatles song: "With a little help from my friends". Recently Jodi from Pleasant Home has given me a few ideas to help with holiday gifts. While looking through her blog and her etsy store I saw something that caught my eye so I emailed her. And she came through for me - evidence above. Thanks so much Jodi. I love it all. But since it is for gifts I can't really show more right now. 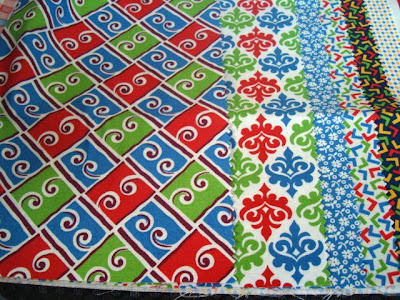 I also enjoyed Jodi's tutorial on pinwheel table runners she showed on her blog and with a baby quilt version on Moda Bakeshop. I decided I would use Jodi's idea and adapt it to Christmas table runners. 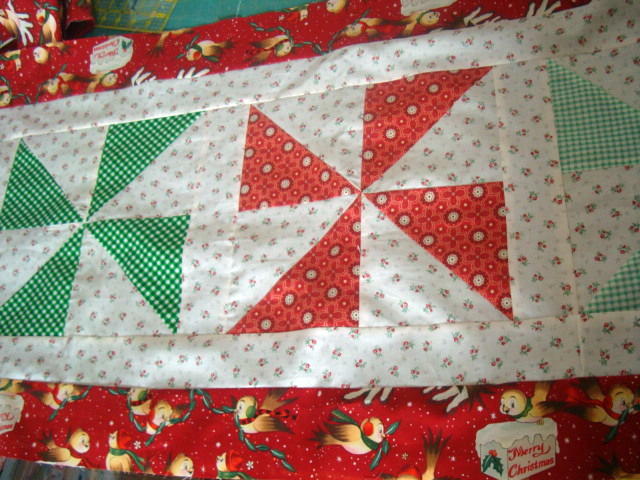 My pinwheels are red and green but not made with Christmas fabric but just from green and red fabrics from my regular stash and then bordered with that sweet Alexander Henry Christmas Birdie fabric I showed last Friday called Santa's Sparrows. I think the idea is simple and classic. Thanks for the idea and tutorial Jodi. 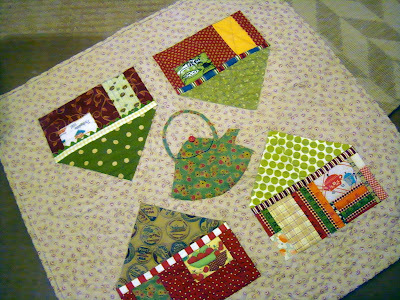 And Jodi's got another cute idea for Christmas: A patchwork Christmas Tree. 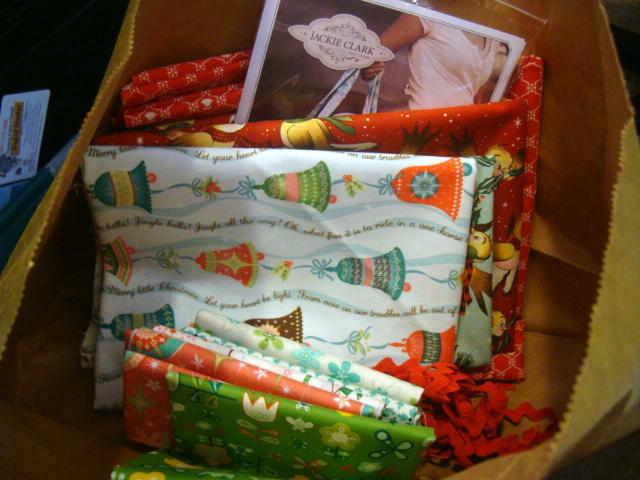 Today's Fabric Friday shows what was in my shopping bag when I spent my afternoon with Lori. Neither of us spent much $, but that wasn't the point. The point was looking at fabrics and patterns together and enjoying the afternoon. I bought a fat quarter of the Sherri Berry fabric on the left. I really like all those fabrics in that line. And also a whimsical fat quarter of birds, trees and Christmas joy. Delightful. 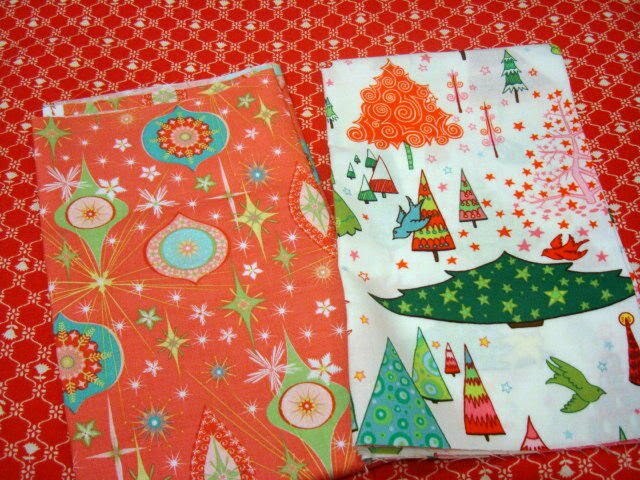 These 3 fat quarters Lori and I both purchased. The green on the right is an obvious purchase because we both love bees and have them on our blogs. The other 2 we just really both liked. Look how great the red looks with that aqua, of course. This red Hello Betty is a print that has been out for a while but I didn't realize how beautiful it was until shopping with Lori. I think I was overwhelmed by the whole line looking at the bolts altogether. 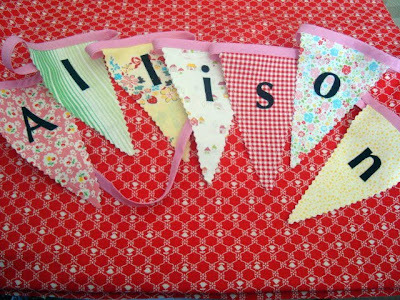 But look alone how sweet and simple the fabric is with just red and white. And I needed red rick rack. We also both purchased this pattern. Neither of us have any idea when we can make this bag but we both want to so maybe we'll have to make it together when we meet in April for a retreat. I really like Christmas fabric. 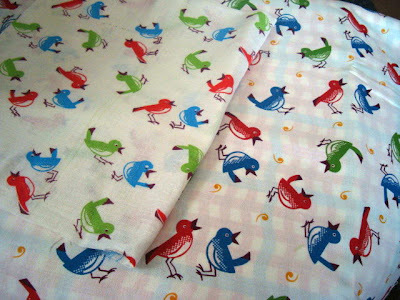 These 2 fabrics in birds are just so cute. I've already used some of it. I'll show you what I did with it next week. So that was it for me. Lori bought some of the new Heather Bailey felted wool blends. The colors of that felt is so pretty, not crayola at all but deep beautiful colors. Maybe she'll show you that on her blog. My friend Sandra works at the fabric store closest to my house called Just Sew. It is fun to see Sandra when I go to the store. She told me she had a little present for me the last time I was in to see her. And here it is! Thanks Sandra! 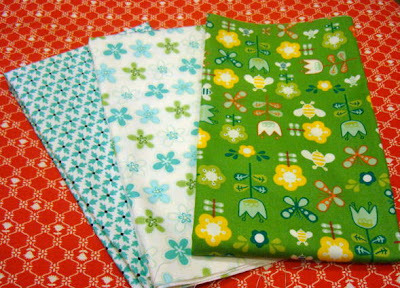 I hadn't seen these 3 fabrics yet and they are so cute. I can see a little zipper bag made out of them. I love novelty fabric and of course Sandra knows that. 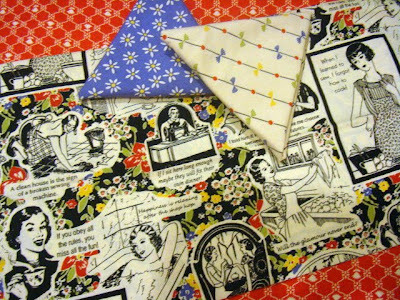 This fun sewing themed fabric is really a delight. My favorite little scene is the one with the woman at the sewing machine and she says "If I sit here long enough maybe they will fix their own dinner" Sounds like my house! Ha. Lori Holt, local quilt designer and girl about town, and I had a fun afternoon together last week. From the moment we start talking til the time to say goodbye we laugh. We have so much in common and have such a fun time together I wish you could all be with us. You'd have a ball. 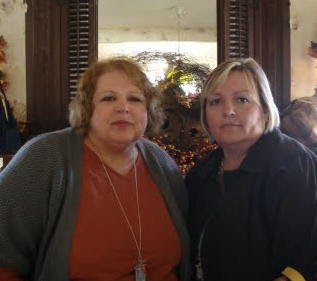 My photo of Lori and I together was totally blurry so I had to swipe this from Lori's blog. Not our best pose but don't let that fool you. We were having a great time. Lori is amazing. She can do everything. Lori made me the best gift. See this sweet necklace above. 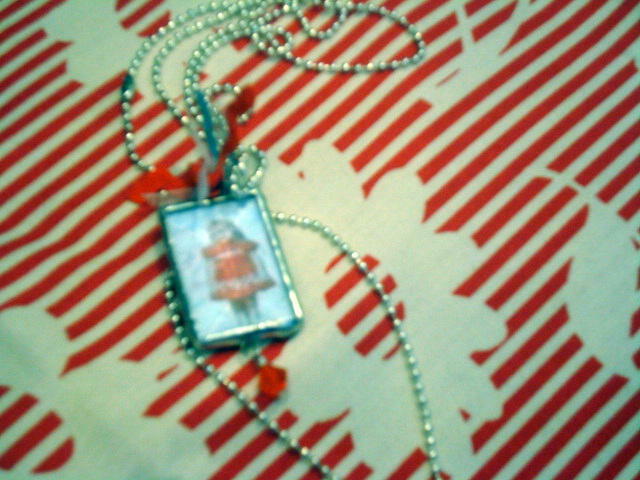 It has my photo of me in my "Nanette" dress that my mom made me for Easter one year many years ago. I really cherish that photo. She couldn't have picked a better choice. Lori made herself a matching necklace with a photo of her as a little girl. She needs to show her necklace on her blog. 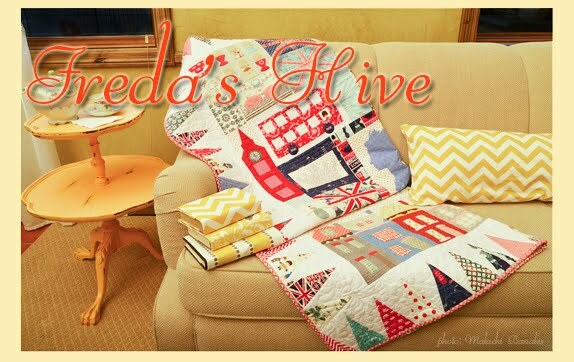 The back of my necklace charm has my "Freda's Hive" logo quilt picture on it. 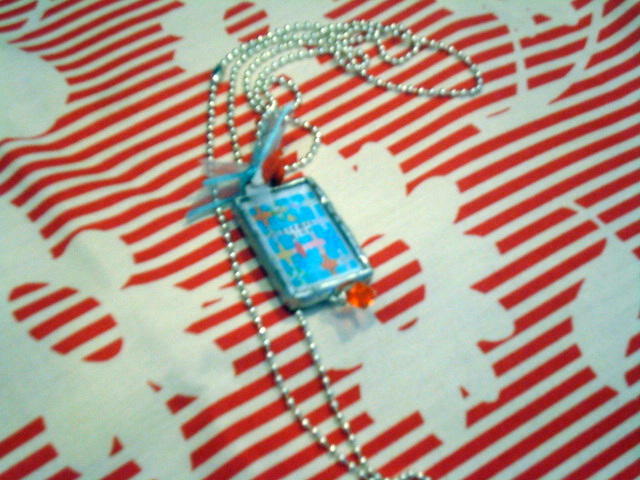 And then it is placed on the fabulous silver ball chain at the perfect length. Isn't that fantastic! I really love it. I have worn it non-stop and show it to everyone. Thank you Lori. I love it so much. 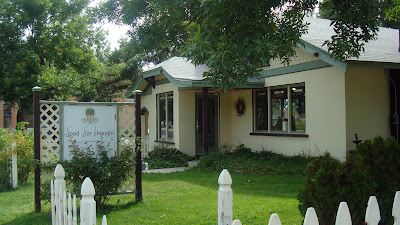 We met for lunch at "Food for Thought" in Draper. It is a great little home town restaurant serving fresh food. We both had the butternut squash soup - so yummy. (By the way I took this photo of the restaurant during the summer.) 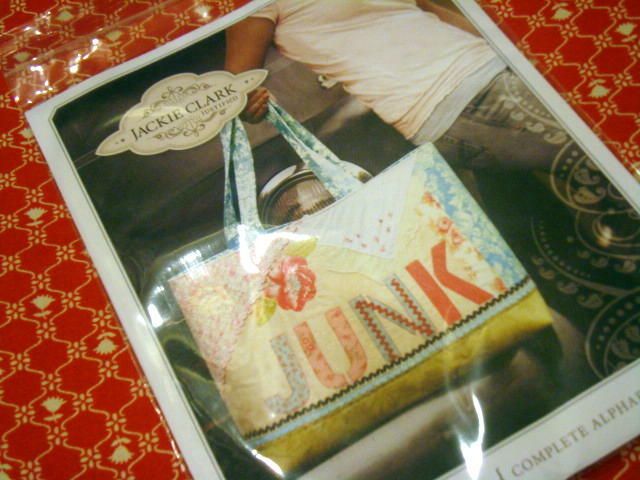 After that we went to Nadine's Material Girls. Nadine always welcomes her customers with a smile and treats everyone like they are her friend. But when I'm with Lori, I feel like I'm family. It makes it more fun. Nadine has a blog, too, in case you didn't know. Here is my "take" from the trip to Material Girls. More on what is in the bag on Friday. It is so fun to shop with Lori. We are drawn to the same fabrics and ideas. Next we went to Aunt Elsie's Trinkets and Treasures located just up from Material Girls on Redwood Road. Fun fun store. 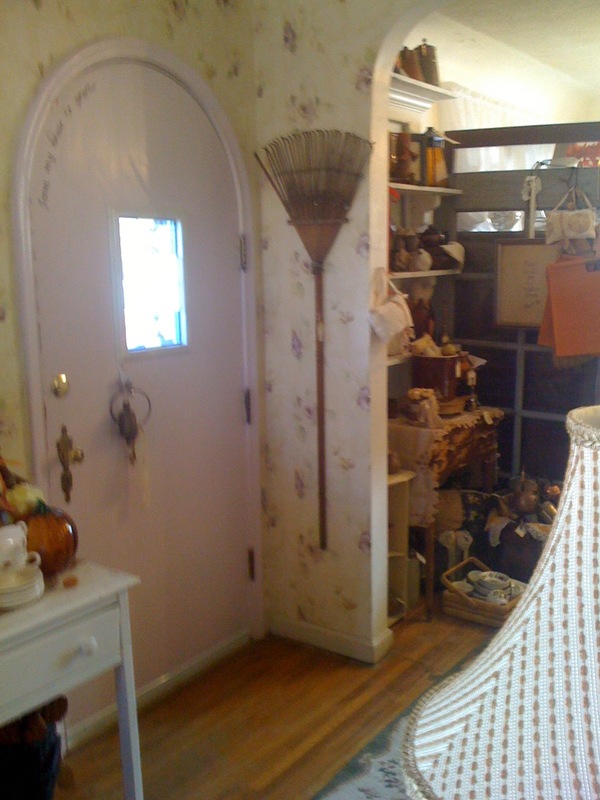 This is the inside of the front door. My photos were not wonderful so I missed some of the lovely treasures we saw. 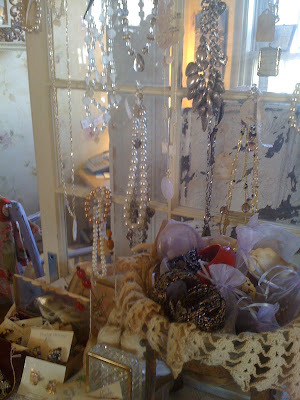 There was fabulous vintage jewelry. I wish I had Freda's stash of jewelry. I used to love to play in it when I was a girl. 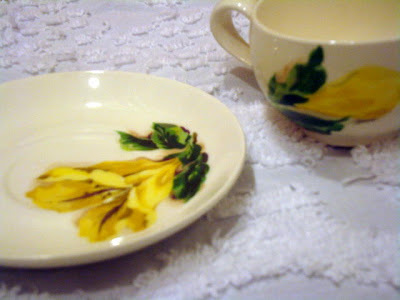 I picked up a set of cups and saucers at a great sale price. 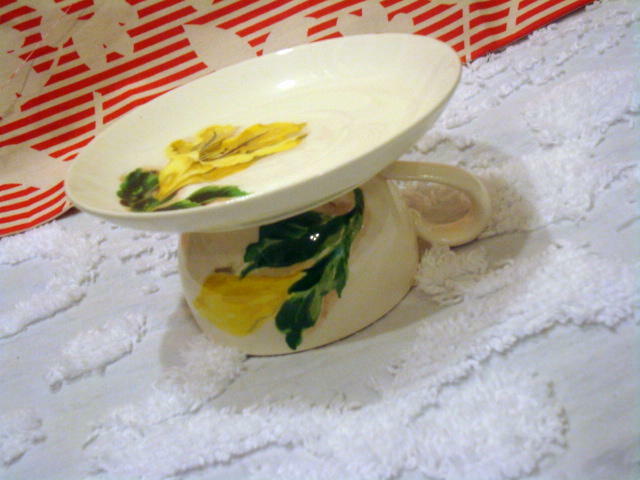 These lovely floral dishes are perfect for a gift idea. I want to make pincushion holders with the teacups and saucers. I know these are also cupcake holders but I'm trying to think what else could you put on top of these little plates that would be cute? I told Lori we need to get together once a month and make it a date. If you happen to be in town and want to go along with us just let me know. You'll have a good time. 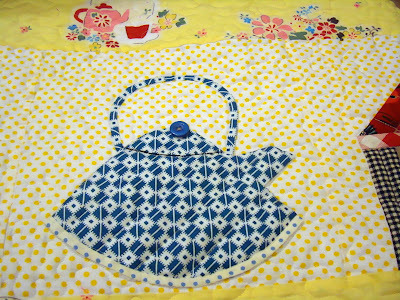 Friday my dish cloth tutorial was on Sew Mama Sew Blog for the Clean and Tidy Day tutorial day. 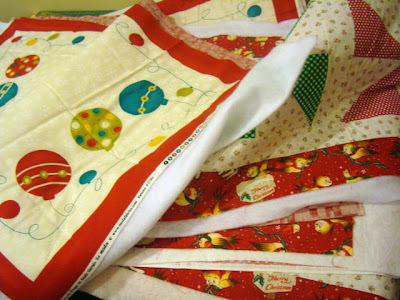 November is tutorial month with so many good ideas for Christmas on Sew Mama Sew. If you haven't been following this event, it is worth your time see what they are showing. Because I don't have my weekend photos loaded I thought I would swipe some photos from friends for today's quick post. First I will tell you I'm one of the most forgetful people. If you have sent me a photo or have made one of my pattern designs and I told you I wanted to put your project on my blog and didn't - it is because I forgot. Duh. So resend that stuff to me, please. And my excuse is I have 8 children. I feel my excuse is justified. Sherri at A Quilting Life is a good friend and she's a dynamo. 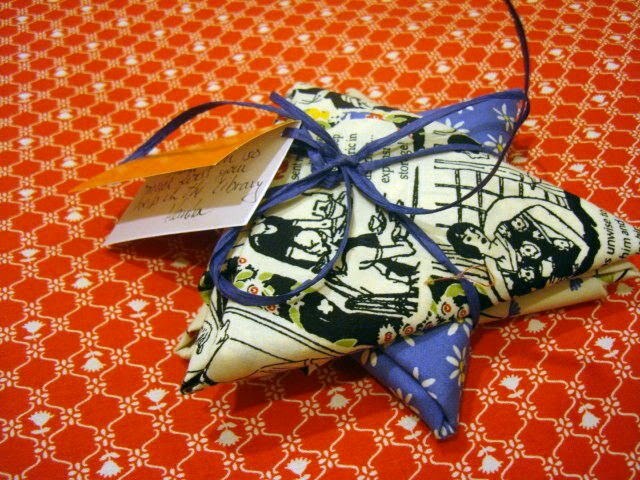 I think smoke must come out of her ears when she's in her sewing room because she's so fast and so good. 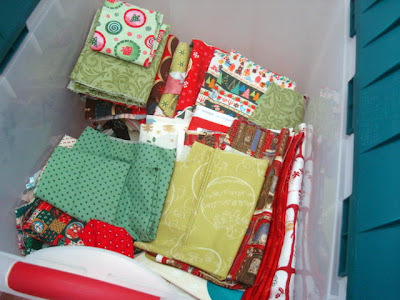 She has made dozens (well it seems that way) of my "Mixed Bag to Quilt" pattern. The one above is made by Sherri and it is so darling. Go to her blog for a complete description. 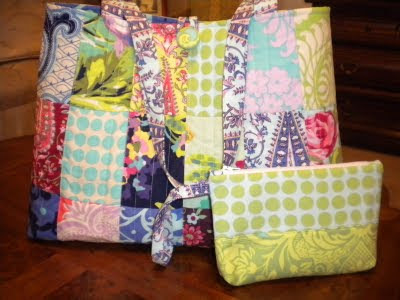 The top row 2nd square is my favorite of the fabrics she used. 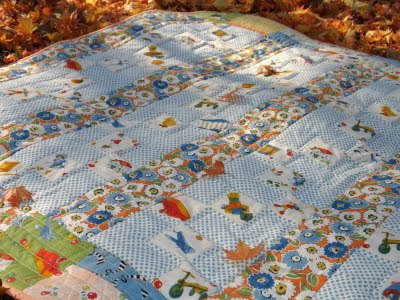 This wonderful baby quilt was made by Pratima of Peeps in the Pepal Tree. Pratima is a sweet friend as well and one of my original blog contacts. 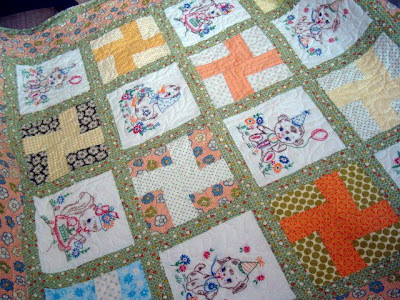 She used my "Cascading Blocks and Stripes" baby quilt pattern that was published in Fons and Porter last year to make the quilt above. Go to Pratima's blog to read how she made it. I love how Pratima took the pattern and made it her own. 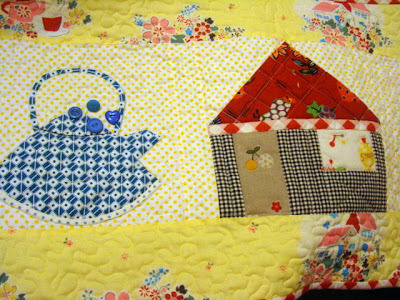 And of course I adore the fabric (and have some of it, too) and how she fussy cut the cascading blocks. Great job Pratima. Allison came to visit Friday and Sunday. She's wearing the cupcake hat Shelbie made her. I didn't get the red pom pom cherry on the top of the hat in the photo. Shelbie will have to show you that another day. Tomorrow I'll post the photos from my afternoon with Lori Holt. It was so fun! I've got full day ahead of me and couldn't find the camera yesterday to post ahead. So I'll zoom through. I've had this feedsack piece for several years. 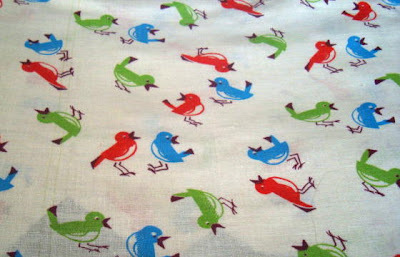 I love the whimsical birds, the colors and how the birds are positioned on the rough weave of the feedsack. I show this photo so you can see the slightly frayed feedsack edge. I also have this feedsack in a pastel colorway. I have cut into it a bit (you can see through the fabric) fussy cutting the birds for different projects, but I've been using them sparingly. 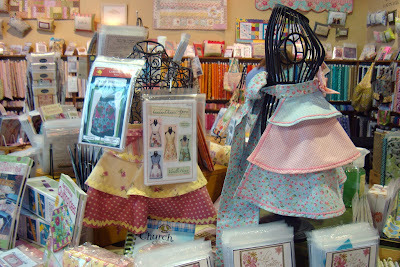 Well much to my surprise, Andover fabric has come out with a line of fabric called Feedsack Melody by Gloria Leonard. 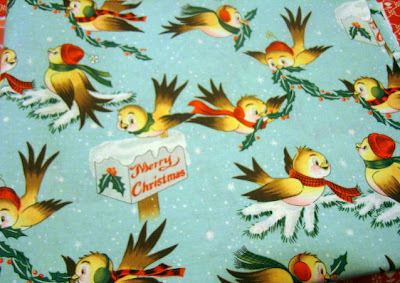 And they used the image of my sweet little birds. I've been through this before when I've had a feedsack and a mostly direct copy has been made. See the comparison above. My feedsack is on the left. The Andover birds are slightly bigger, slightly different in color and have the gold swirl. 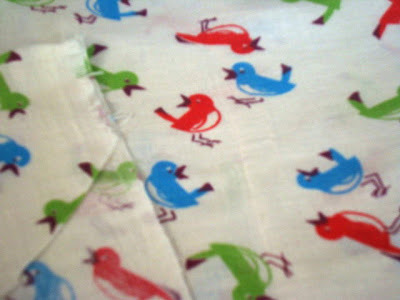 Of course I prefer my real feedsack birdies but I did purchase a fat quarter set of the Andover fabric. It is kind of bitter sweet for me. I like having yardage of my favorite feedsacks and I'm happy to see them come back to life but I kind of feel sad for the original fabric. Weird I know. 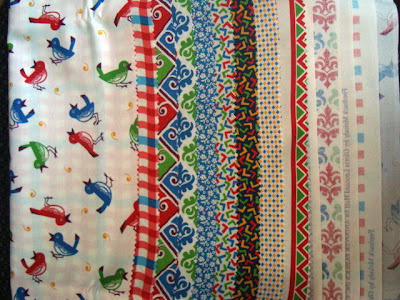 Some of the companion fabric I really like and some I don't. I like these first 3 fabrics but not some of the others very much. I pulled out my Christmas stash. 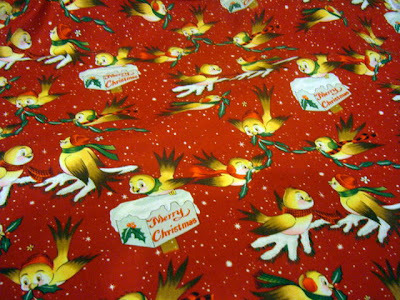 It is time to do some Christmas sewing. 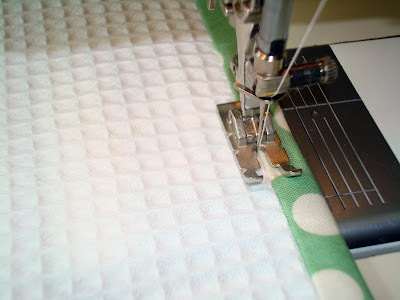 I took a little time off this week to start some sewing. I really didn't get much done though. Today I'm off to meet with Lori Holt! I know. Lucky me! 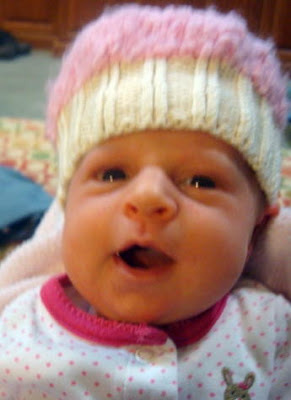 Baby Allison is coming over later today. And it is a very special birthday today - Laura, my friend and neighbor. Happy Birthday Laura. She is like me. She hates too big of a fuss so I'll probably get in trouble for saying something. Oh I love a good finish. It is so satisfying to lay out your work in front of you and sit back to admire. In this case most of this wasn't my work but I did have the chance to finish this project and put it together. 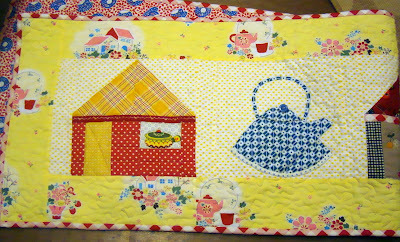 It is more scrappy than my sister would have chosen to finish this quilt off so I hope she will like it. 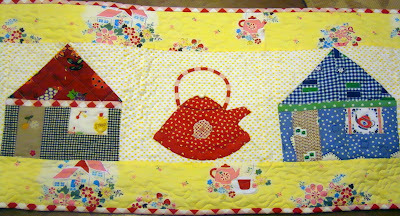 The blocks came together well and it is just a fun little quilt. I have the binding machine sewn to the edges all ready for her to hand stitch in place. I hate to mail quilts but since she lives in Nevada I just may have to do that. 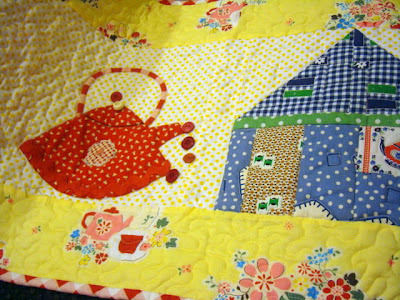 I have both her quilts all ready for her and even though it took a few months. They are done! 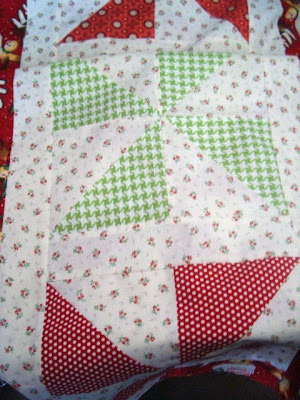 I quilted my table runner/table topper project. As I said before they are gifts for friends as a thank you for helping me with the wedding. I hope they like them. 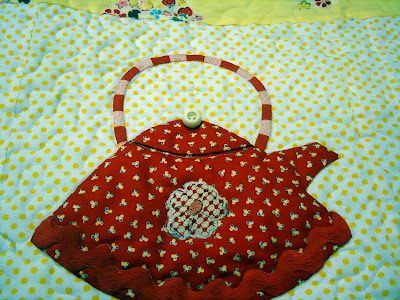 I detail quilted the kitchens and kettles and then stippled the rest. I was deciding on what button to top the kettles. I like wading through my button jars. The buttons are fun to play with and position over the kettles while I stand back to decide what is best. 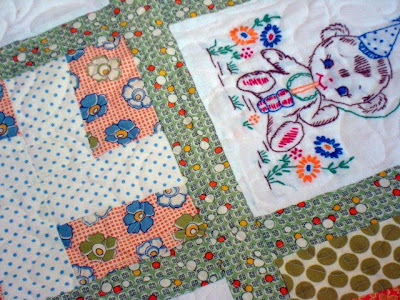 I love the fabrics in this little quilt. Oops that button looks like I got it a little off center. I went with a plain blue. It was hard to decide. I went with a little white button on this one because the red buttons just seemed to blend in too much. 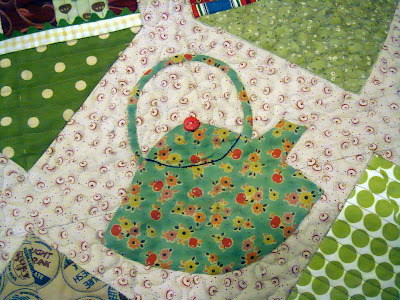 I saved the red for this kettle on the square table topper (to fit a round table). I wish I had an apple button but this red round button works. And so here is half the finish on the table runner. And the other half. I think the yellow makes the whole thing rather story book illustration-like. And here is the finish on the table topper. It has upside down cottages so when you are at the other side of the table there is still something to look at.